About two weeks ago, Toronto's No. 30 prospect Riley Adams suggested Nash Knight should play all nine positions in a game to Casey Candaele. The Class A Advanced Dunedin skipper responded with a "Yeah, we'll see," and left it at that. Knight and the catcher thought the proposal was simply swept under the rug. That was until Knight caught a glimpse of the lineup when he arrived at the clubhouse Sunday. "I walked into today and saw my name on the lineup card with a 'two' next to it, so I figured there was something different," said the utility infielder. Knight played all nine positions starting at catcher and finishing in right field in Class A Advanced the Blue Jays' 6-5 loss in 10 innings to the Tortugas to conclude the Florida State League regular season. The 25-year-old began the game behind the plate, catching Dunedin right-hander Maverik Buffo, who gave up a run on three hits in the first inning. Buffo, who throws 90 to 93 mph, made it easy as possible for Knight. "He's a really good pitcher, man," Knight said. "He spots up, he's got good stuff and he's always got a plan. He did a good job. He's a good guy to catch because he knows where the ball is going and commands it really well. It makes it easier." Then the Dallas Baptist product made his way from right to left in the infield, moving to first base in the second inning and ending up at third by the fifth. Knight started the sixth in left field, but flipped with reliever William Ouellette after one out and relinquished a single to Alberti Chavez before the two switched back. "It was really funny, because all the pitchers were fighting over who was going to play outfield," Knight said. The Denton, Texas, native moved to center in the seventh and shifted to right in the eighth to cap the feat. He stayed there for the final two frames. Eight innings, nine positions played and Knight did not commit a single error. "I'm really thankful that our coaches and our organization gave me a chance to do that," Knight said. "It's definitely something I'll remember for the rest of my life." 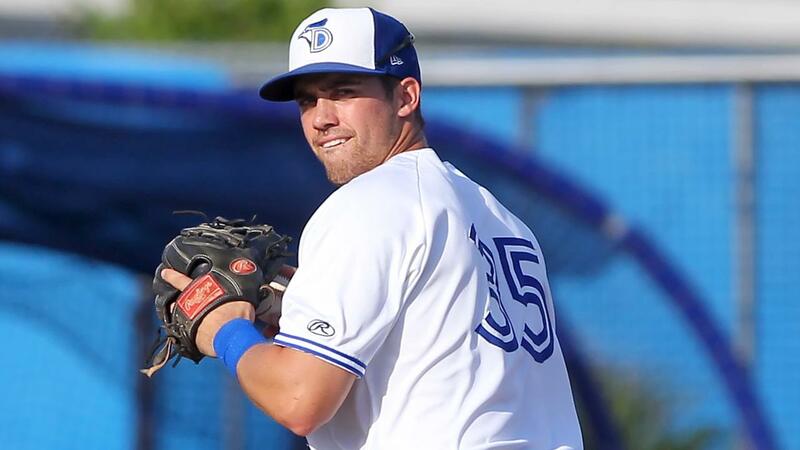 Signed as an undrafted free agent by the Blue Jays in 2015, Knight has developed a reputation as a versatile defender, playing five different positions -- first base, second base, third base, left field and pitcher -- for the Blue Jays entering Sunday. Knight has served as an emergency catcher in pro ball and expects to help out behind the plate in Spring Training. At the plate, he went 0-for-4 with a walk and a run scored. Rodrigo Orozco collected two hits to raise his average to .304, tying him with Blue Jays teammate Ivan Castillo, who did not play, for the Florida State League batting title. Logan Warmoth was 3-for-4 with a double and three RBIs for Dunedin. Morgan Lofstrom slugged a go-ahead homer over Knight's head in the 10th to put the Tortugas ahead. Bruce Yari went 4-for-5 with a double and two RBIs while Randy Ventura and Courtney Hawkins both added three hits for Daytona.